A lick of paint and a splash of color can do even the dingiest, direst corners a world of good, and that’s whether we’re talking a small, private space or a big, public one. 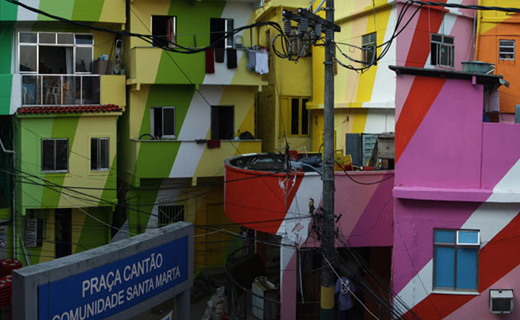 I recently read about a drive that’s transforming Rio de Janeiro’s slums through community-driven art. 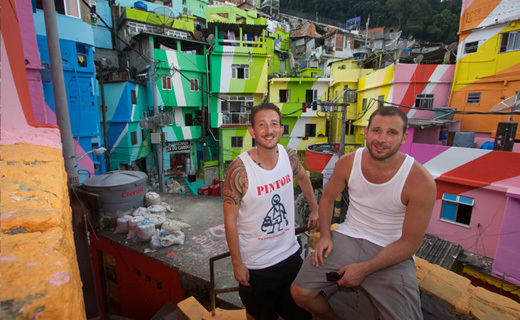 Called the Favela Painting project, it’s all been cooked up by Dutch artist duo Haas&Hahn, and they’ve already done and dusted two campaigns in Vila Cruzeiro (Rio’s most notorious slum). 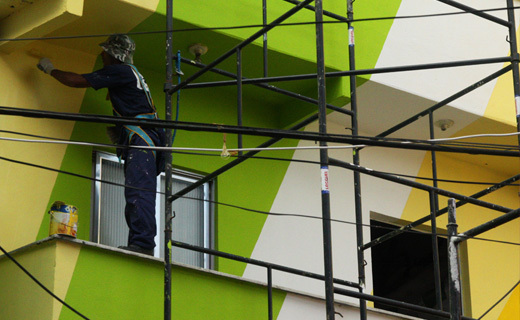 Now efforts are focussed on O Morro, where the plan is to prettify an entire hillside slum: already 34 houses and some 7,000 square meters have had a brush with beauty. 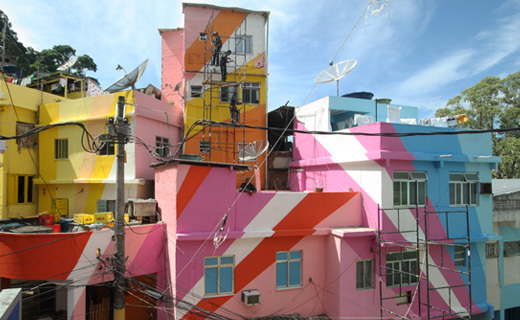 This got me thinking: there are unadorned, eyesore-style spaces all over the urban world: imagine what dashes of color and design could do. 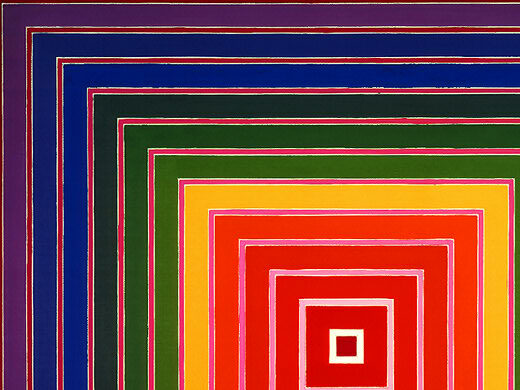 It must have been the idea of adding color and charisma to a city environment that inspired Frank Stella’s Sacramento Mall Proposal #4 (1978). 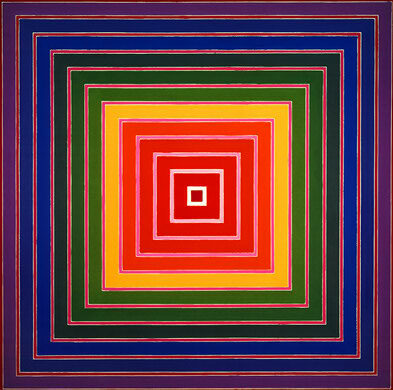 I’ve been itching to give you a slice of Stella (born 1936) since we started, as he’s such an icon of American Abstract Art. When he started on the art scene in the late 1950s, Stella struggled in the wake of abstract expressionism, which had set the standard for avant-garde art since the late 1940s. So Stella searched for a new way, his own way, to approach the canvas. Over the course of his career, he’s been mind-blowing in his technical invention, ranging from an austerity close to Minimalism in early paintings to multi-colored, 3D works that tussle and tumble off walls. One of Stella’s earliest and perhaps most enduring solutions to the painting problem was the stripe: a series of black “pin-stripe” paintings made his name in New York in 1959. He stayed on the austere tack through the early 60s, but gradually his canvases took on more curved shapes and more bright color. The Sacramento Mall Proposal #4 from the late 70s certainly harks back in some sense to the repetition and flatness that he found so useful at the start of his career: here we have an arrangement of thin-strip squares, set in a nesting format across the canvas. Stella seems still entranced by working systematically in a specific series: it’s a sort of problem-solving approach to painting. The rhythmic geometric arrangement creates a surface that is at once staid and scintillating: order and reduction are set against an energetic rainbow run of kinetic color. It was in the 1970s that Stella started his move away from flat works to compositions which projected out from the wall. He worked with collage at first, then progressed to shallow reliefs and finally fully spatial constructions that could even be considered sculptures. What’s interesting about the Sacramento Mall Proposal #4, is that while it’s 2D and done in acrylic on canvas, it still possesses it’s own proposals for projection: in the mind (a mall??) and in the eye.